Calling all quilting enthusiasts! 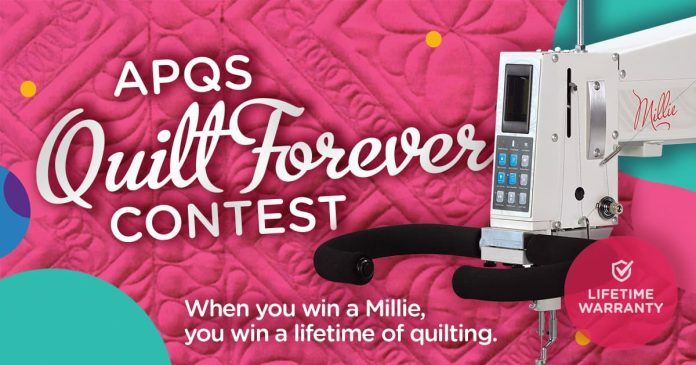 APQS is giving away a brand new Millie longarm quilting machine with the APQS Quilt Forever Contest. One lucky quilter who enter this APQS Millie Giveaway will receive an APQS Millie longarm quilting machine, valued at $19,700. Plus, each month throughout the Giveaway Period, a few other lucky winners will get an APQS Quilting Gift Basket full of thread, patterns and other great goodies. There are three ways to enter the APQS Longarm Giveaway, as detailed below. Online: By visiting the Giveaway website at https://www.apqs.com/shopping-tools/giveaway/millie/ then completing the form and clicking the submit button. By mail: By hand-printing your name, complete address, email address and date of birth either on a postcard or on a separate piece of paper no larger than 8½ x 11 inches, and mailing the postcard or paper in an envelope with the proper postage affixed to: APQS c/o “APQS Quilt Forever Contest”, 23398 Hwy 30 East, Carroll, IA 51401 USA. In Person: By filling out the registration form at an APQS booth at a tradeshow. Grand prize: One (1) grand prize winner shall win the grand prize, which consists of one (1) APQS Millie longarm quilting machine, valued at $19,700. Monthly prizes: Three (3) monthly prize winners shall win the monthly prize, which is an APQS Quilting Gift Basket. The APQS Quilt Forever Contest is offered worldwide to individuals who are 18 years of age or older at the time of entry. This contest will end May 31, 2019 at 5 p.m. CDT. Limit one online entry on the APQS website, per eligible person with a valid email address per day. Entrants using U.S. mail may enter one postmarked entry per day. You can enter once per day, regardless of the method of entry you choose. For complete details about this APQS Giveaway, please read the official rules.